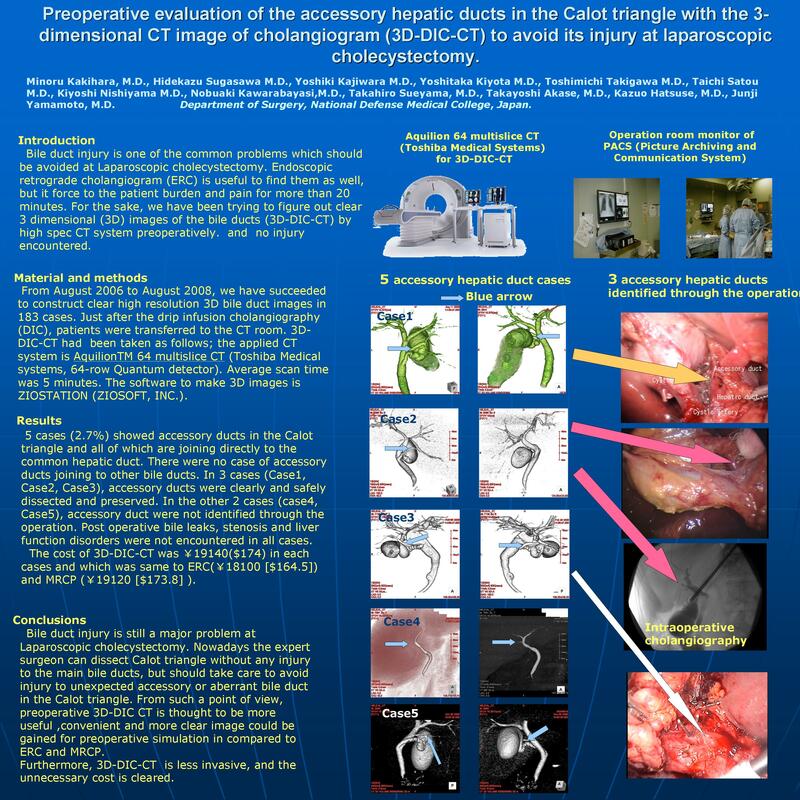 Preoperative Evaluation of the Accessory Hepatic Ducts in the Calot Triangle with the 3-dimensional CT Image of Cholangiogram (3d-dic-ct) to Avoid Its Injury At Laparoscopic Cholecystectomy. Introduction: Bile duct injury is one of the common problems which should be avoided in the Laparoscopic cholecystectomy. Endoscopic retrograde cholangiogram (ERC) is useful to find them, but it force to the patient burden and pain for more than 20 minutes. For the sake, we have been trying to figure out clear 3 dimensional (3D) images of the bile ducts (3D-DIC-CT) by high spec CT system. Materials and Methods: From August 2006 to August 2008, we have succeeded to construct clear high resolution 3D bile duct images in 183 cases. Just after the drip infusion cholangiography (DIC), patients were transferred to the CT room. 3D-DIC-CT had been taken as follows; the applied CT system is AquilionTM 64 multislice CT (Toshiba Medical systems, 64-row Quantum detector). Average scan time was 5 minutes. The software to make 3D images is ZIOSTATION (ZIOSOFT, INC.). RESULTS: 5 cases (2.7%) showed accessory ducts in the Calot triangle and all of which are joining directly to the common hepatic duct. There were no case of accessory ducts joining to other bile ducts. In 3 cases, accessory ducts were clearly and safely dissected and preserved. In the other 2 cases, accessory duct were not identified through the operation. Post operative bile leaks, stenosis and liver function disorders were not encountered in all cases. The cost of 3D-DIC-CT was 19140($174) in each cases and which was same to ERC(18100 [$164.5]) and MRCP (19120 [$173.8] ). CONCLUSIONS: Bile duct injury is still a major problem at Laparoscopic cholecystectomy. Nowadays the expert surgeon can dissect Calot triangle without any injury to the main bile ducts, but should take care to avoid injury to unexpected accessory or aberrant bile duct in the Calot triangle. From such a point of view, preoperative 3D-DIC CT is thought to be more useful for preoperative simulation in compared to ERC and MRCP. For instance, ERC is tough for the patient and its image is simple two dimension, although MRCP is not so tough but its resolution image is rough (Scan time; 30minutes. Slice thickness; 3mm. Matrix:256*300 pixels). Contrary, 3D-DIC-CT is less invasive, the unnecessary cost is cleared and its resolution is higher (Scan times; 5minuts. Slice thickness; 0.5mm. Matrix:512*512 pixels) in comparison with the MRCP.